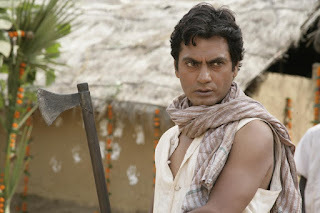 Story Line : It's an story of a poor man Dashrath Manjhi (Nawazuddin Siddiqui) of Bihar. He lives his life struggling everyday and loves his wife Phaguniya (Radhika Apte) so much. He lives in a village which is cut off from the world by a rocky mountain range. One day, while climbing the mountain to bring him food, his wife slipped, fell and died. Overwhelmed by grief, Dashrath decides to carve out a path through the mountain, so that no one else would suffer his fate. For 22 years, all by himself, with just a hammer and a chisel, he hammered away at the rocks, till the path was carved out from the mountain. What's Good : Bollywood has created lots of biopic's to inspire the young generation, but this one is very interesting, heart touching and inspiring. Screenplay is quite impressive, it will remind you of the time when India got freedom but people from village still had to face troubles for roads, water and freedom. Every character has performed very well and Nawazuddin has proved himself once again. What's Bad : No bad things in the movie, but it might make you cry! Our Opinion : It's a must watch. When I watched the movie it reminded me my grandmother's tells. The film shows us how many of difficulties our grandparents may have faced? How they struggled? It's such an amazing movie and very inspirational. You will only find love, drama and inspiration in the film.